First Colony Inn in Nags Head, North Carolina, teamed up with Pepsi® and Mountain Dew® to give away a very special prize package as part of the “2013 Iconic Summer Hometown Sweeps” promotion. We are happy to have participated in the 2013 Iconic Summer promotion and glad that our winner enjoyed her time at First Colony Inn. This special prize package was won by J. Miller from Rural Retreat, Virginia, who received a four-night stay at First Colony Inn in addition to gift certificates to several Outer Banks restaurants, tickets to local attractions and passes to events on the Outer Banks. The value of the package provided by First Colony Inn was $996. In late May 2013, Pepsi and Mountain Dew announced the "Iconic Summer," giving fans the chance to win a wide variety of incredible prizes and experiences. According to Innkeeper Sarah Close, Miller stayed at the inn in August and appeared "surprised and delighted" to have won such a generous prize package. Placed in the National Register of Historic Places, the First Colony Inn now stands on the coast at Nags Head as the last remaining "beach-style" hotel. The inn offers 26 rooms, each with a private bath. 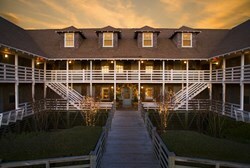 First Colony Inn is managed by Village Realty, a full service real estate firm on the Outer Banks. For more information, please visit http://www.FirstColonyInn.com or call the inn at 252.441.2343.